Jump into the Wayback Machine with me! We’re going to post-glasnost Russia! Now in my bleak Russian hotel room, sitting on my narrow bed [the coarse, less than white sheets would not be changed during my stay, and bore the bloodstains of many slain mosquitoes]. Time has changed a full 11 hours for me – I’m almost half-way around the world. Flight was bumpy and very full. Couldn’t see anything but clouds. Actually walked down steps to a little bus to reach the terminal. Waited almost an hour for our luggage. Dad and Margaret had brought suitcases full of food, toilet paper, and duty free alcohol [later I would appreciate the wisdom of this]. 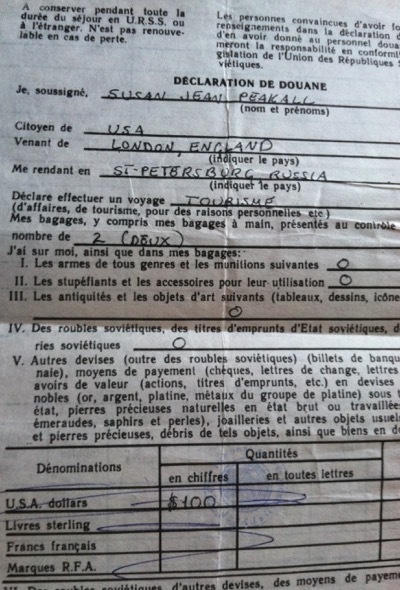 We filled out declarations forms in French, asking whether we were importing firearms or objet’s d’art, and how much money we had and in what currency. The terminal was very small, but had high vaulted ceilings decorated with stirring paintings of World War II. After the bags finally arrived, they were x-rayed, found satisfactory, then we went through yet another passport control and onto yet another bus, which took us to the hotel. The Hotel Moscow looks like the projects and has a distinctively ’70s decor. Found a cockroach in Dad and Margaret’s bathroom, but he met a watery doom. They also have tiny twin beds, but their room overlooks the Neva. View from my room is completely uninspiring: backs of buildings and a construction site. Well, it was a walk on the wild side today. Breakfast was mystery meat, mystery porridge, some weird soggy cheesecake type thing with no crust, hard bread, and weak coffee. Our ultra coiffed Intourist guide, Margarita, was giving some spiel during breakfast, and Dad suggested we leave during it to get some rubles. 400 rubles equal one pound, so we made the 400 ruble dash, as money often runs out before noon. 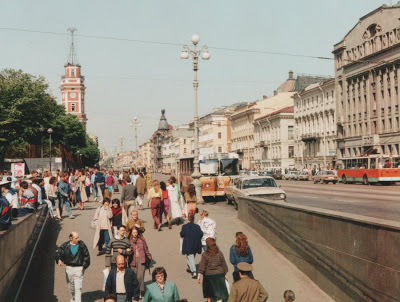 We escaped into the sunshine and walked up Nevsky Prospekt [it’s the main street], but it’s three miles long and our hotel is situated at the boring end, so we got on a tram. The shops are really strange – no displays, or mystery displays. Many are down stairs and through dark doorways, filled with lots of people and few goods. In the markets, people were selling odd assortments: shoes, candy, a toothbrush, what appeared to be home-made vodka, maybe a melon or two. I did meet a little kitten outside a cheese shop and played with him until Dad came and got me. I miss Buddy so much, and it was a pleasure to meet and pet a Russian cat. We finally figured out that the word that looks like “PECTOPAH” means “restaurant”. We opened one such door into a wide foyer and were beckoned past painted walls and up a flight of red carpeted stairs into what looked like an enormous nightclub. For $5, we were each given tomatoes with dressing, an egg shaped like a flower, borscht and beef stroganoff. I’m sorry to say that I’m not adjusting very well to the food here. I guess I’m just not a third world kind of girl. On our way back down Nevsky Prospekt, we passed a long and animated line, which we learned was for cigarettes, a hot commodity. Everyone smokes everywhere here and they all seem to smoke the same brand, which smells worse than Gaulloises and Gitanes. We finally reached the Hermitage, which is beautiful, painted green and white and presiding over a great square. The other side of the square is dominated by the admiralty building, a sweeping yellow Palladian-style building. We knew the Hermitage was closed that day, but enjoyed walking by it to the river. From the river, we could see the Peter and Paul fortress, its golden dome and spire glowing in the afternoon sun. A YEAR AGO (2014): Feeling powerless. 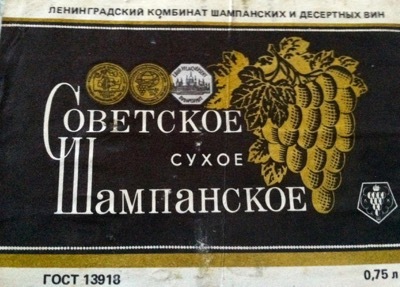 In 1987 I went on a mission trip to the USSR, and my group had a joke about PECTOPAH. Like, “I’m hungry. When are we going to the pectopah?” We also drank a lot of “Nench,” which is what the Pepsi logo looked like to us. Alison, how funny! I bet our experiences were different in pre- and post-glasnost Russia!